Finding a perfect business name can be one of the most frustrating, overwhelming and most challenging experience while starting your business. Your business name can be the very first impression you will make to your potential client and you know how important the first impression is. You might be thinking what’s in a name? Well, the name of your business not only differentiates you from your competitors but it also tremendously affects how clients and investors view you, and in today’s world, it’s an overall choice. Names are quite powerful than you imagine. A good name with a proper marketing strategy can be icing on cake. So, all you need to do is to find a name that best suits your business, embody your values and helps you stand out in the crowd. Naming a business is not a complex task, anyone can do it. But, it does not mean it is easy to do a good task, though. 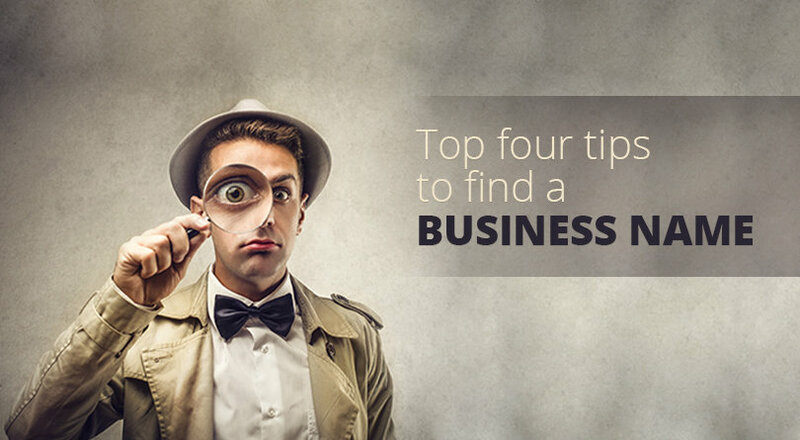 Here’s top four points to consider while determining a business name that incorporates your business characteristic features. If you want to stand out in the crowd, choose a name that is simple yet has its meaning and conveys what you do to your audience. Paypal is a great example; it is short, simple and easy to pronounce too. By hearing its name, people can easily have idea that the company is related to making payment or a money request or invoice. One of the keys to success of your business is the short, simple and recognizable name. The shorter in length, the better is the name. It is proven that the great companies throughout the history had five to ten letters in their name. For e.g. Google, Yahoo, Apple, Cisco, Starbucks, facebook, etc. These names are too easy to remember and pronounce. In today’s world of digitalization, a business cannot run successfully without being in web. The operation of business nowadays is fully dependent on web presence to generate leads. Now, you might be thinking how to get in web? Well, you need not have to worry. The procedure is so simple. First, you need to build a website and launch it live. To go live, you have to register a domain name and get a website url. In order to claim a website url, choose a business name that is unique and available online. Check the availability of your business name online by doing domain name search of your business name. I prefer GoDaddy, it is one of the best websites to buy and check the availability of domain name online. GoDaddy also gives you various alternative domain names if the name you were considering is already used. If your business is local and you want to target only your local customers then, including your state or country in your domain name can make your local customers easier to find you. A good name that relies on some real testing and data can be more effective. Including keywords that most of the people enter to search the products or services that you offer can do a great job in search engines. Use testing tools like Google Adwords to find the most relevant and high search rate keywords. The “keyword planner” tool is a keyword research tool of Google AdWords, which helps to list similar search phrases and keywords with its global and local monthly searches. Check your competitors online and find your target audience. Adwords also helps you with a long list of keywords and phrases that are slightly different from yours but has more search rates and are popular in your niche. To use this tool, all you need is a google account. When you are done with selecting the perfect name for your business, now, it’s time to make sure it is legally yours. No one likes to go through legal procedures, especially me, I hate it. The easiest way to be away from those hectic legal procedures is to find a good lawyer in town and let him handle the entire legal task. I hope you enjoyed the process of finding a relevant business name that perfectly matches your business. Just keep one thing in mind, a relevant business name can really help and be a good Ad for your business. So, take your time and choose the best one.